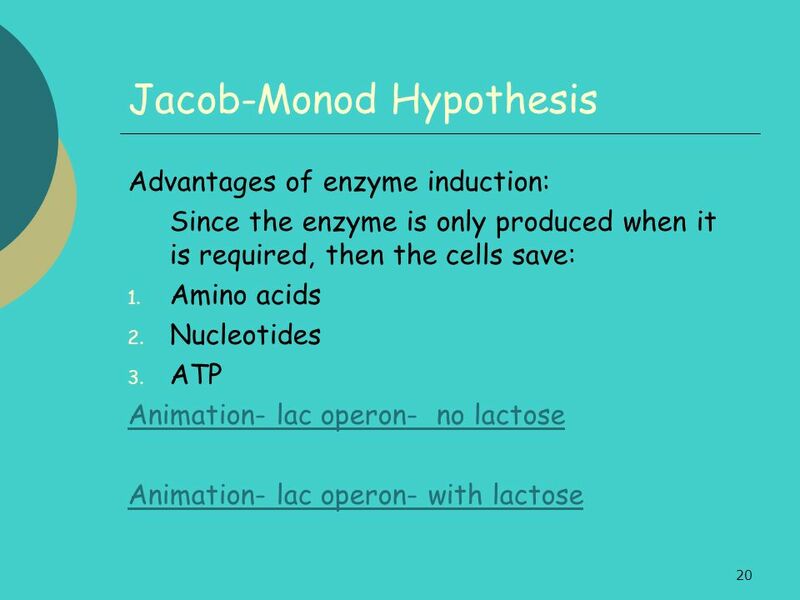 By the end of this lesson you should be able to: Describe the Jacob-Monod hypothesis of gene action in bacteria. Explain lactose metabolism in Escherichia coli. Describe the role played by genes in the control of metabolic pathways. Know what PKU is and how it is caused. 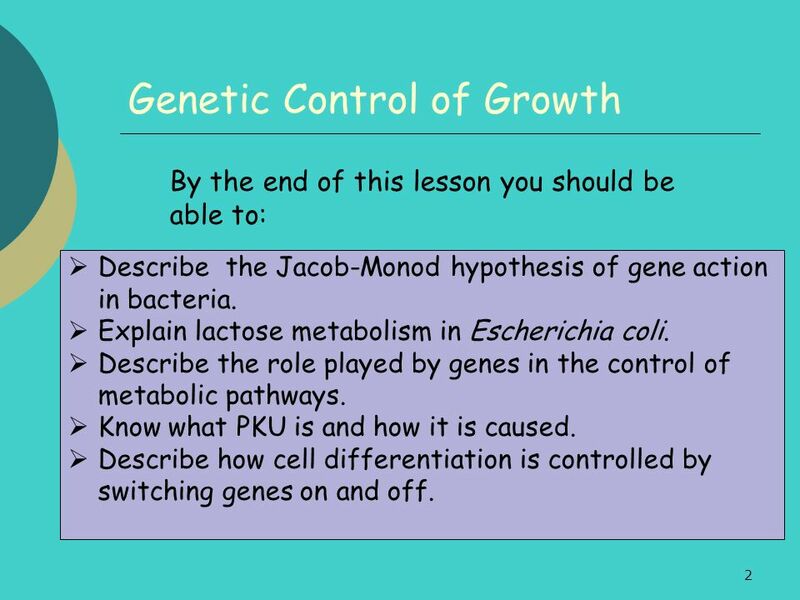 Describe how cell differentiation is controlled by switching genes on and off. Genes determine the structure and function of every cell in an organism. DNA is made up of a series of genes. Genes code for proteins which perform all the functions required by the body. 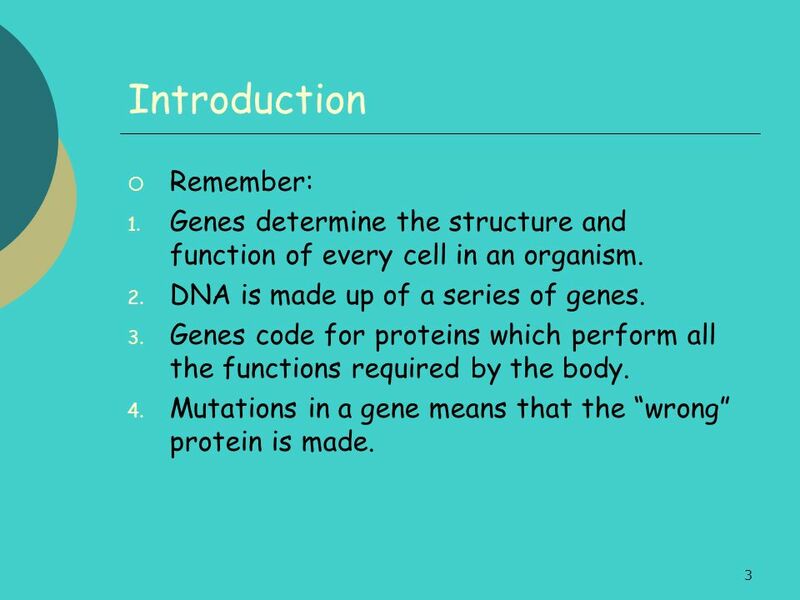 Mutations in a gene means that the “wrong” protein is made. Read pages in Torrance and then answer the following questions: Describe the sets of genes present in a cell arising from a zygote. 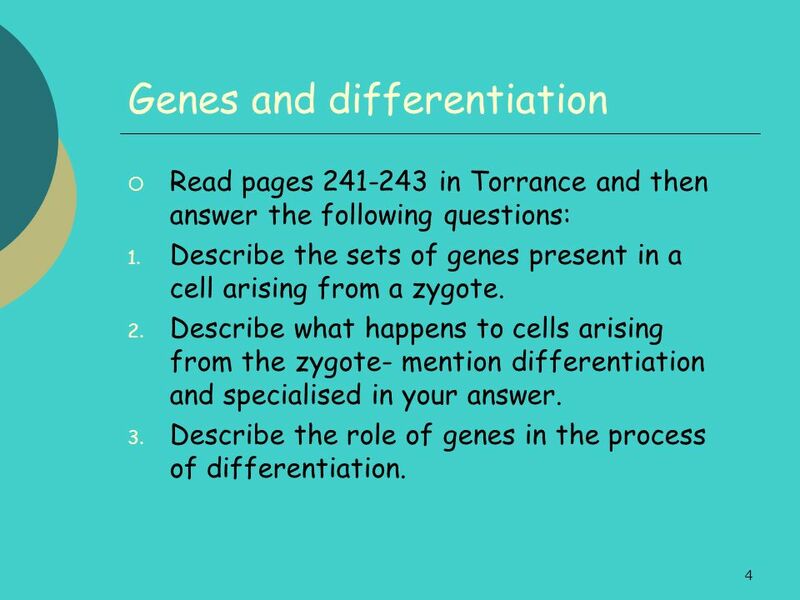 Describe what happens to cells arising from the zygote- mention differentiation and specialised in your answer. Describe the role of genes in the process of differentiation. 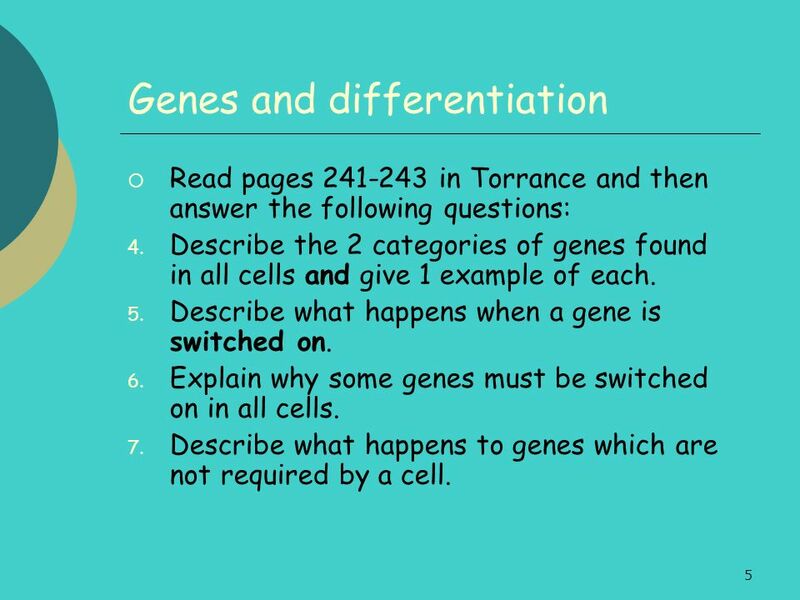 Read pages in Torrance and then answer the following questions: Describe the 2 categories of genes found in all cells and give 1 example of each. Describe what happens when a gene is switched on. Explain why some genes must be switched on in all cells. Describe what happens to genes which are not required by a cell. Insert and complete the “Genetic Control of Blood Cells” diagram from your pack. Insert and complete the “Genetic Control of Plant Cells” diagram from your pack. When an enzyme is needed by a cell, a gene has to be switched on to make the enzyme. 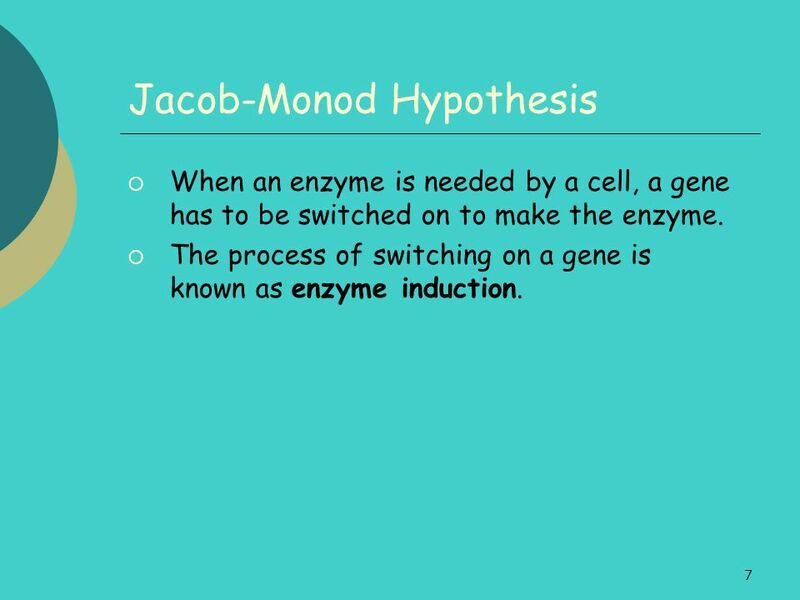 The process of switching on a gene is known as enzyme induction. 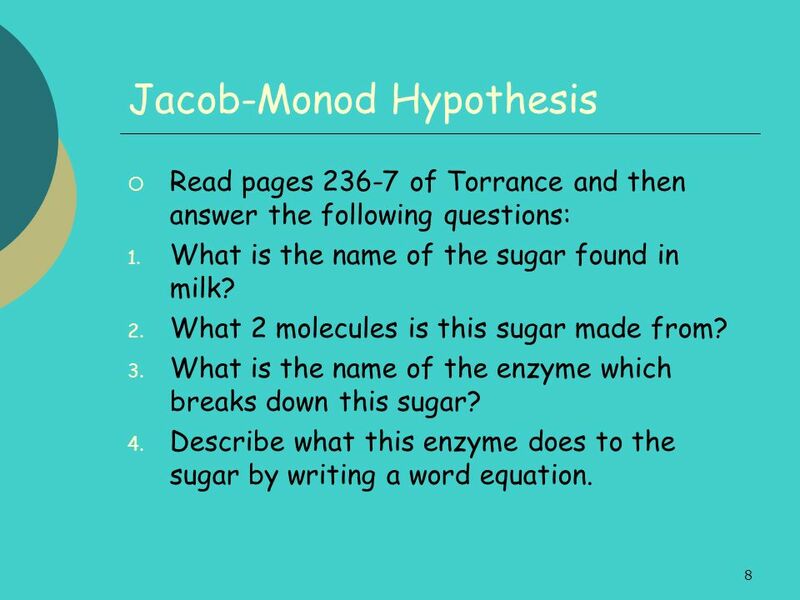 Read pages of Torrance and then answer the following questions: What is the name of the sugar found in milk? What 2 molecules is this sugar made from? What is the name of the enzyme which breaks down this sugar? Describe what this enzyme does to the sugar by writing a word equation. 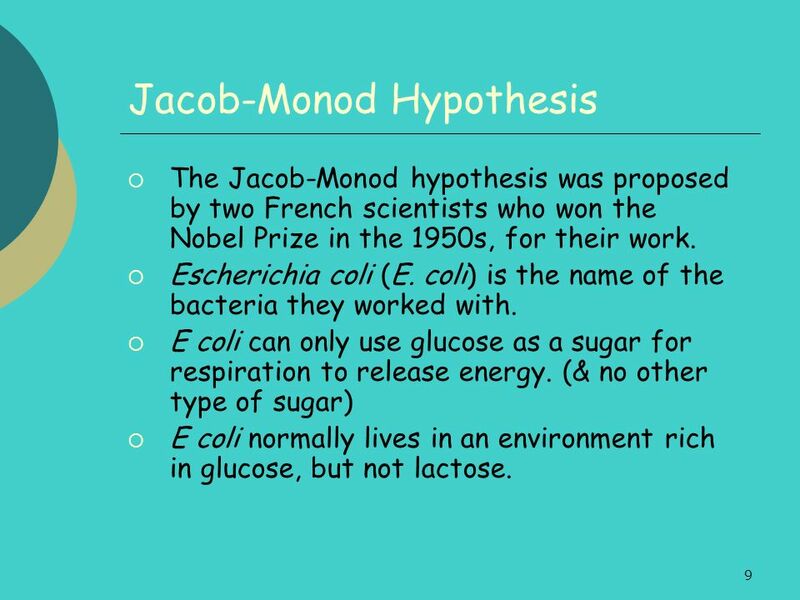 The Jacob-Monod hypothesis was proposed by two French scientists who won the Nobel Prize in the 1950s, for their work. Escherichia coli (E. coli) is the name of the bacteria they worked with. E coli can only use glucose as a sugar for respiration to release energy. (& no other type of sugar) E coli normally lives in an environment rich in glucose, but not lactose. 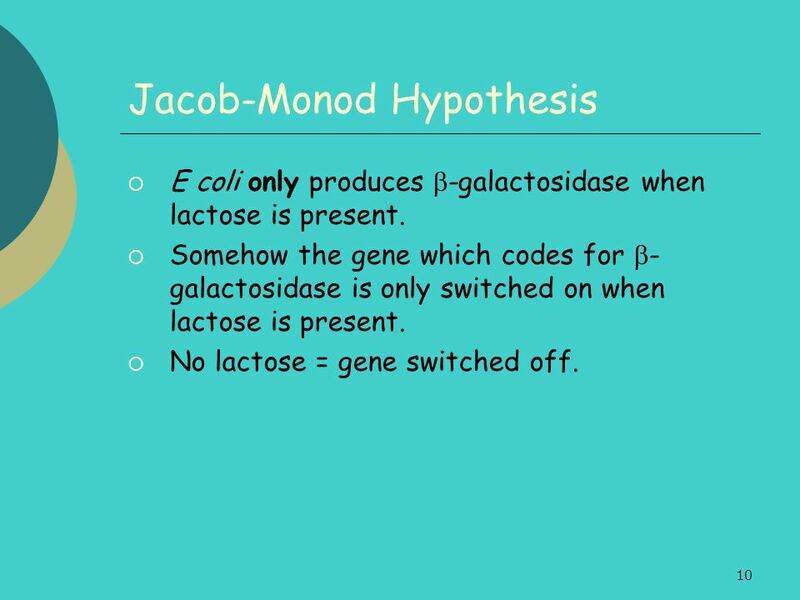 E coli only produces b-galactosidase when lactose is present. 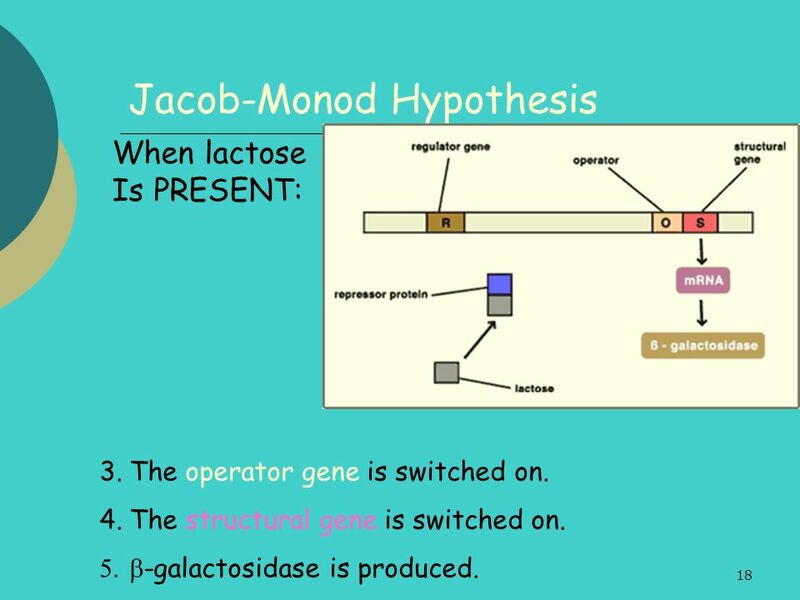 Somehow the gene which codes for b-galactosidase is only switched on when lactose is present. No lactose = gene switched off. 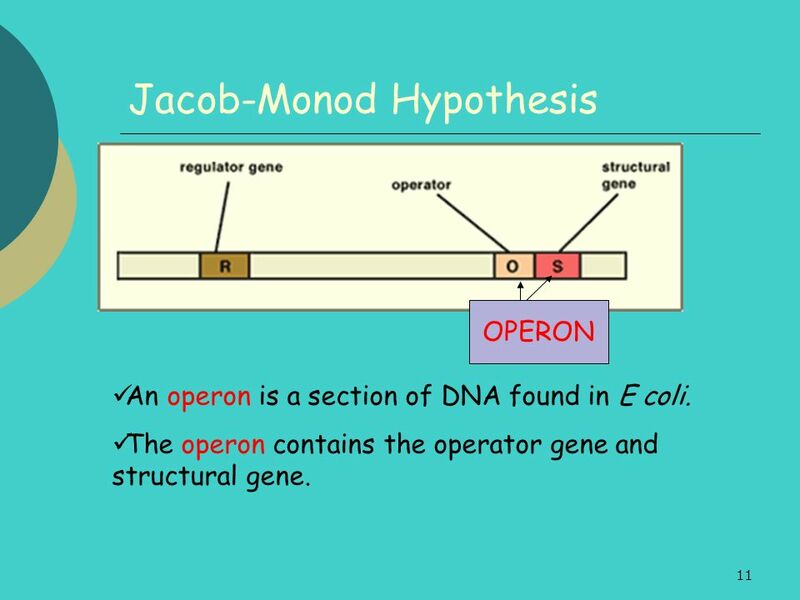 OPERON An operon is a section of DNA found in E coli. The operon contains the operator gene and structural gene. OPERON The structural gene codes for the protein- in this case b-galactosidase The operator gene controls the expression of the structural gene. 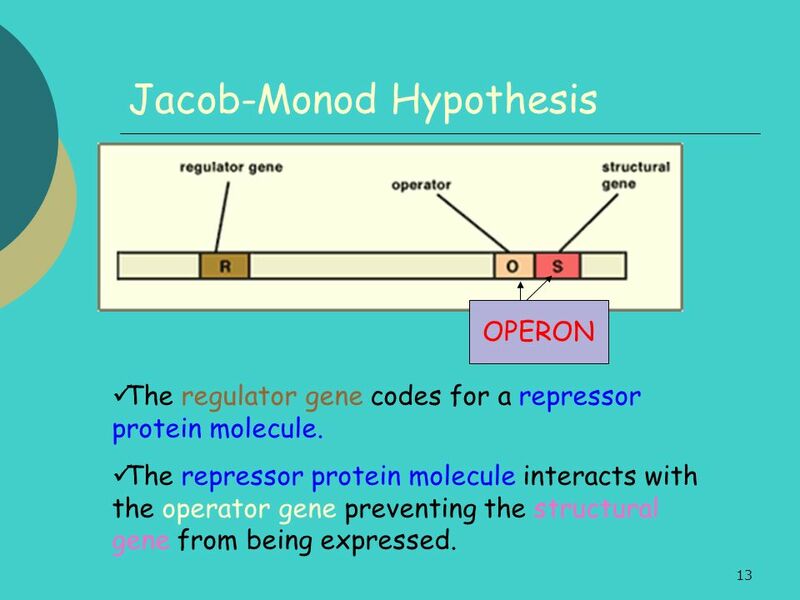 OPERON The regulator gene codes for a repressor protein molecule. The repressor protein molecule interacts with the operator gene preventing the structural gene from being expressed. OPERON Lactose acts as an inducer by preventing the repressor protein molecule from binding to the operator gene. 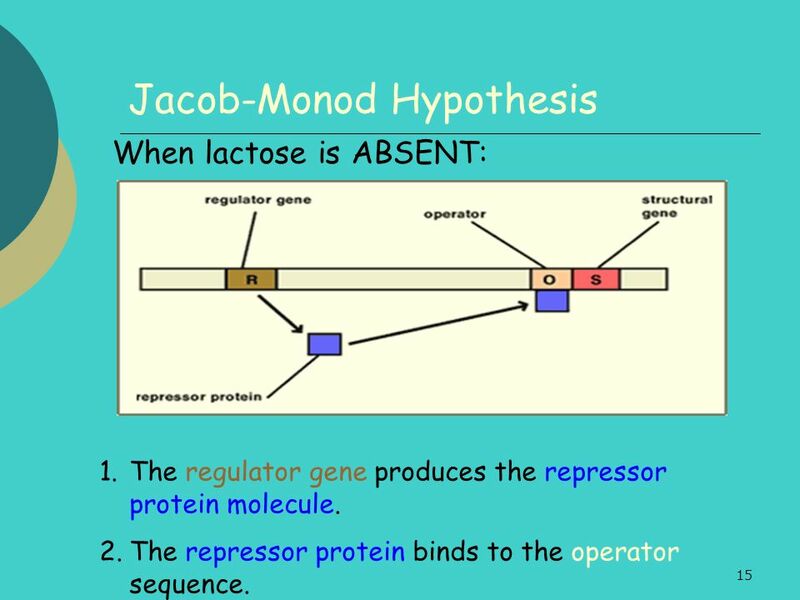 When lactose is ABSENT: The regulator gene produces the repressor protein molecule. The repressor protein binds to the operator sequence. 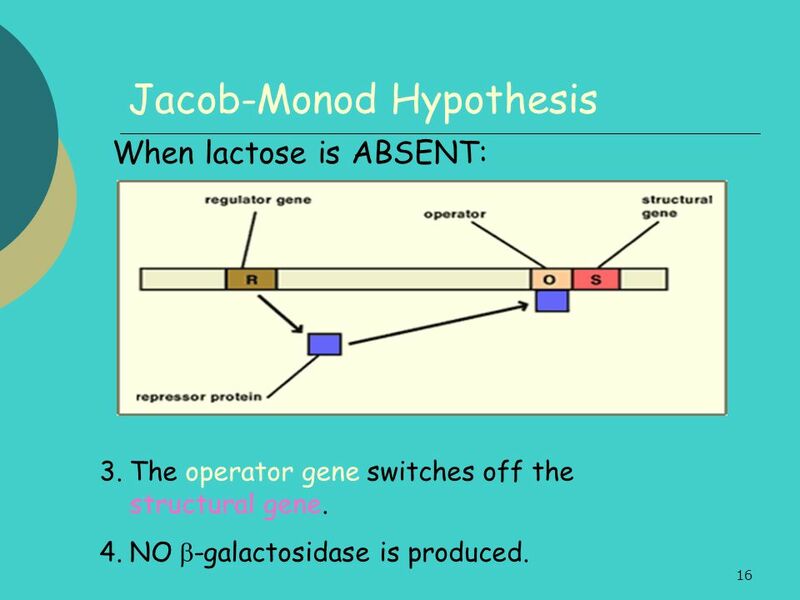 When lactose is ABSENT: The operator gene switches off the structural gene. NO b-galactosidase is produced. 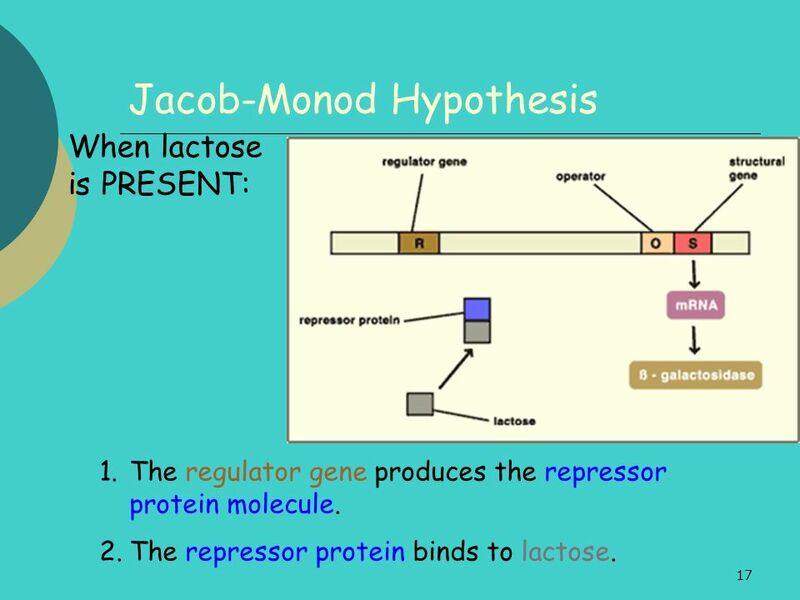 When lactose is PRESENT: The regulator gene produces the repressor protein molecule. The repressor protein binds to lactose. When lactose Is PRESENT: The operator gene is switched on. The structural gene is switched on. b-galactosidase is produced. As the lactose is used up then there is less to bind to the repressor molecules. The repressor molecule is then free to bind to the operator sequence. This switches the structural gene off and b-galactosidase production stops. 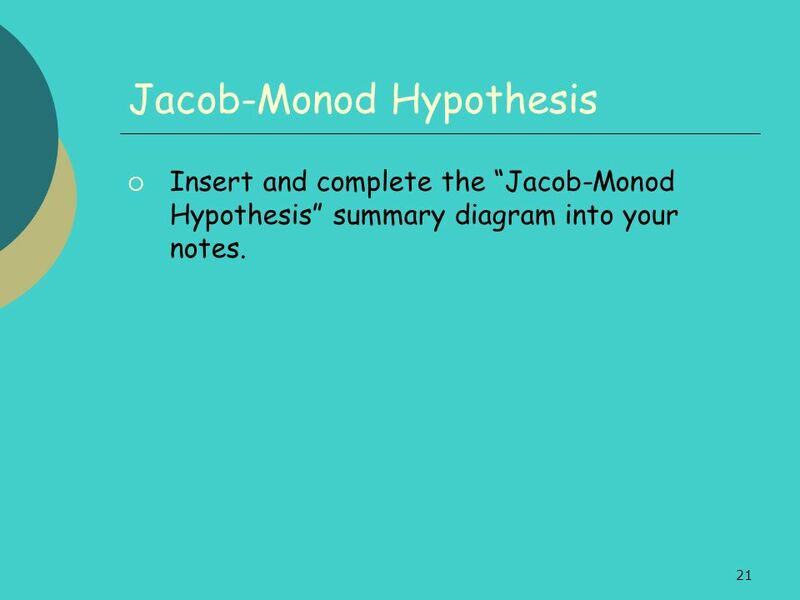 Insert and complete the “Jacob-Monod Hypothesis” summary diagram into your notes. All the reactions that keep an organism alive are collectively called the metabolism. A metabolic pathway is a series of reactions, each controlled by enzymes, which either synthesises or breaks down substances. Each enzyme is a protein coded for by a particular gene. If there is a fault in the gene (mutation) there could be a fault in the enzyme. Copy Fig 29.6 from p239 of Torrance. Read about Phenylketonuria (PKU) on pages , and then answer the following questions: What is phenylalanine? What is the source of phenylalanine for humans? What normally happens to phenylalanine in the body? What type of disorder is PKU? 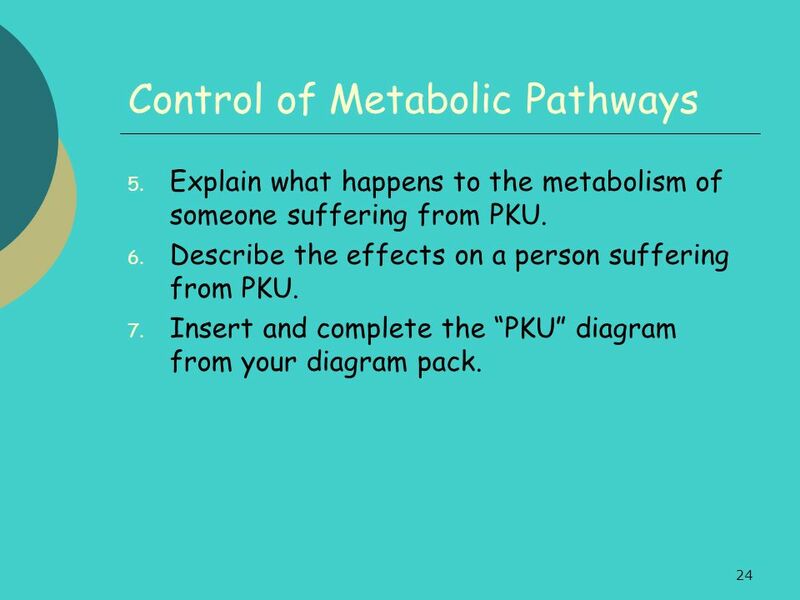 Explain what happens to the metabolism of someone suffering from PKU. Describe the effects on a person suffering from PKU. Insert and complete the “PKU” diagram from your diagram pack. Can you do it? 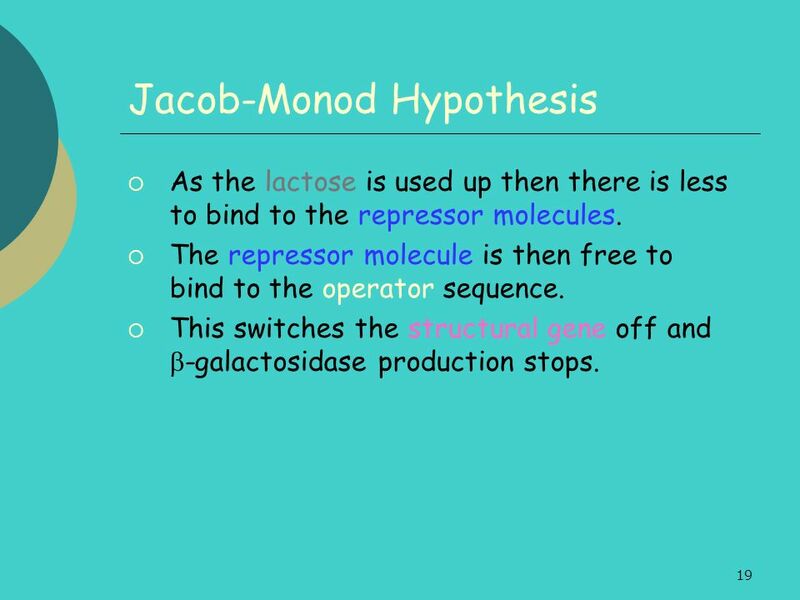 Describe the Jacob-Monod hypothesis of gene action in bacteria. Explain lactose metabolism in Escherichia coli. 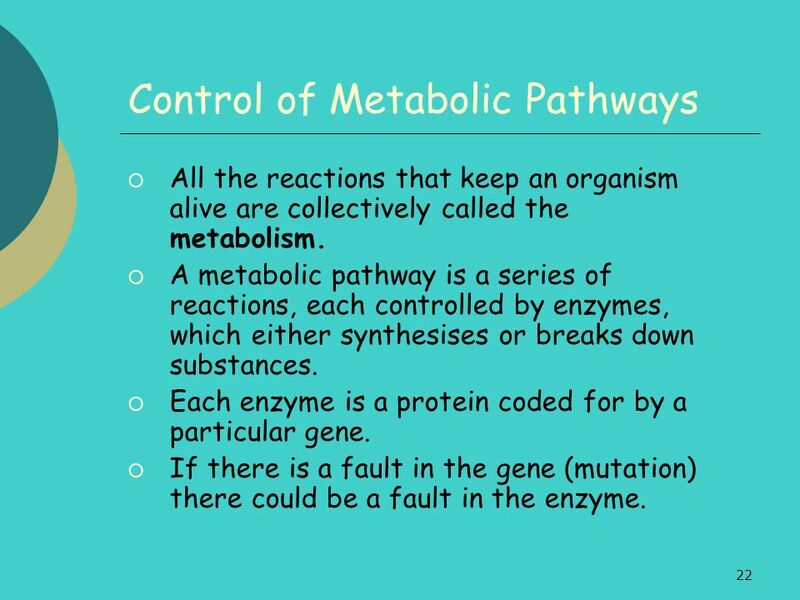 Describe the role played by genes in the control of metabolic pathways. Know what PKU is and how it is caused. 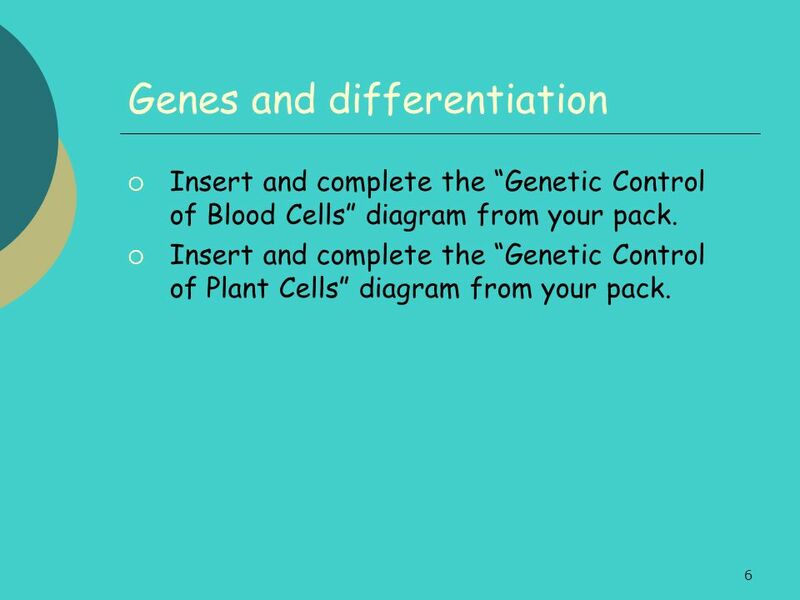 Describe how cell differentiation is controlled by switching genes on and off. 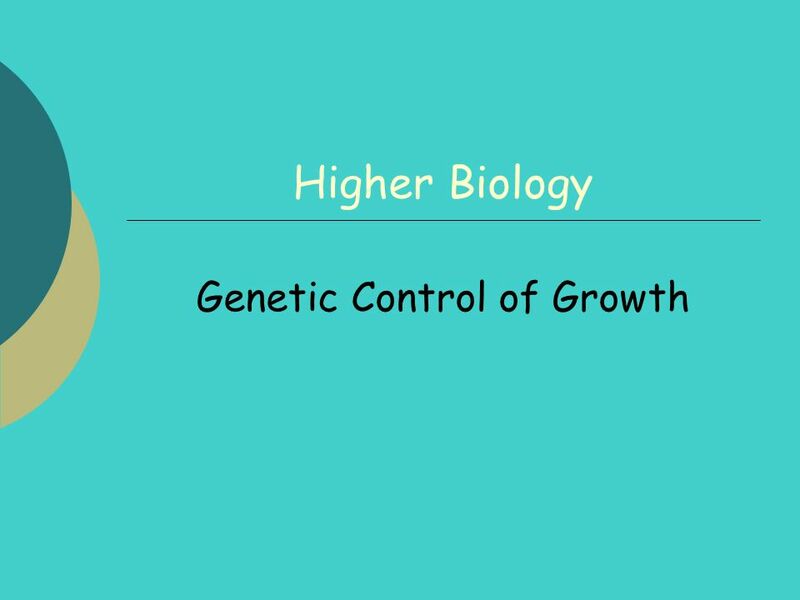 Download ppt "Genetic Control of Growth"
GENE REGULATION Virtually every cell in your body contains a complete set of genes But they are not all turned on in every tissue Each cell in your body. THE lac OPERON © 2007 Paul Billiet ODWS. Synthetic Biology Part 1: Introduction Input Output Gene A Gene B Gene C 1. Mark, Set, ….Go!. 1) Biology is the study of 2) A testable explanation of an observation. TITLE: Chemistry Benchmark review STANDARDS-1h,4ef, 1b TURN IN WHEN COMPLETE NAME, DATE, PERIOD. ROW #1-33 ANSWERS ONLY Letter & word.